"Where'd he get to now?" is probably on the list of things you don't want the Secret Service asking about President Obama, who's started saying 'the bear is loose' while ditching the White House to go for strolls among the public. He did it three weeks ago on a walk to the Department of the Interior for an event, and he did it again on Monday because he is ready to go back to being a guy who grabs tea at his local Sbux on the reg. Seriously: Obama stepped out and walked to a Starbucks. To order a tea. Just a simple tea. Now, I live in DC. Monday was hot. Muggy. Iced tea would have been a better choice. Maybe even a Frap, eh, Barry? But anyway, Obama got a tea, and then he made a bunch of references to how he is a bear that escaped. AGAIN. 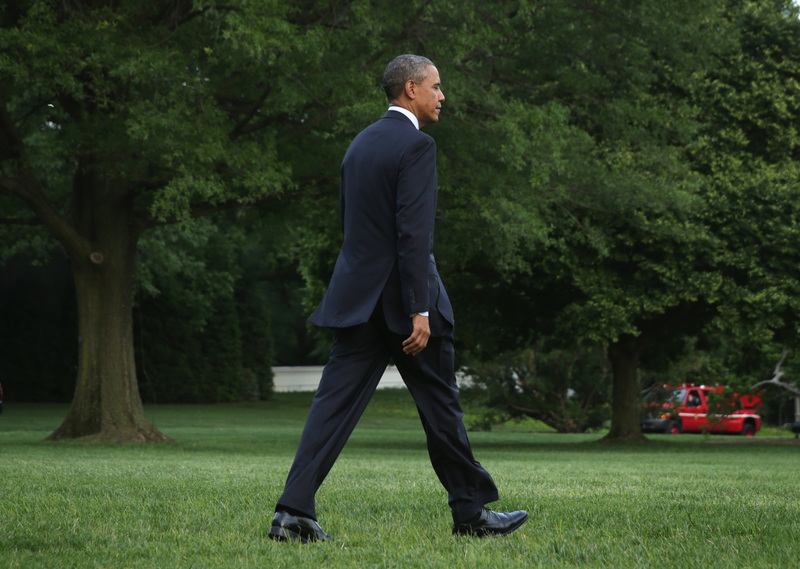 Politico reports that Obama blew kisses to passersby on the walk. #Hero status. Honestly, self-referential Obama is our new favorite Obama. I don't get a chance to take walks very often. Secret Service gets a little stressed. But every once in a while I'm able to sneak off. I'm sort of like the circus bear that kind of breaks the chain. Let's test your wrangling skills. According to this bizarrely-specific calculator, Obama's been in office for five years, 142 days, and counting. That is a lot of time to be shadowed by a crush of the world's most intense bodyguards and breath-holding PR staffers, lovely as they no doubt are. So we are totally on-board with this new hand-shaking, wrangler-harassing, man-of-the-people Obama. See you soon, Bear Obama.